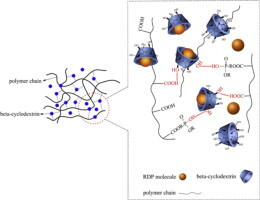 Resorcinol bis (diphenyl phosphate)/β-cyclodextrin/phosphorus-containing polyacrylate (RDP/β-CD/P-PA) composite emulsion was prepared by using β-CD as a compatibilizer. The flame retardancy of the composite latex film was investigated by microscale combustion calorimetry (MCC), thermogravimetric analysis (TGA) and scanning electron microscopy (SEM). Mechanical properties of the composite latex films were also studied and a possible compatibilizing mechanism was proposed. The results showed that the mechanical properties and flame retardancy of the RDP/β-CD/P-PA composite latex film were enhanced compared to the RDP/P-PA latex film. When the β-CD content increased from 0 to 10 wt%, the pendulum hardness of the RDP/β-CD/P-PA composite latex film increased from 0.18 to 0.54, and the peak heat release rate decreased from 382.1 to 311.9 W/g. TGA and MCC results demonstrated that both the char residual and the quality of the char formation were improved by the introduction of β-CD. This article was published in Brandposten n°49. Infrared cameras detect energy in the form of infrared radiation from hot bodies and create a thermal image of the temperature differences. The technology is currently used for many different applications and has in recent years increasingly been used in fire prevention measures. Among other things, infrared cameras contribute to improving fire safety in tunnels, including the Mont Blanc tunnel and the Bjørvika tunnel in Oslo, in that they can detect a fire much earlier than ordinary surveillance cameras. SINTEF NBL has an infrared camera of type FLIR GF-309. The camera measures temperatures from -40 °C til 1500 °C, it “sees” through smoke and flames and provides useful supplemental information in fire tests and to fire research. The infrared camera provides visualization of temperature distribution on the surface of a specimen, and thermal video sequences show the temperature distribution changes with time. The sensitive optics of FLIR GF-309 can detect temperature differences of less than 25mK. Our infrared camera can be used to visualize and detect so called “hot spots”, i.e. areas of a specimen that reaches substantially higher temperatures than the rest of the specimen, during exposure to a fire. Figure 1 is a good illustration of this. Here, the fire resistance of a non load-bearing wall with steel beams and to layers of ordinary plaster on each side is tested in a vertical furnace. The infrared image clearly shows areas where the surface of the wall has elevated temperatures. The aim of this study was to investigate and compare the flame retardant properties of boron compounds with respect to aluminum trihydroxide (ATH) in an epoxy system based on bisphenol A epichlorohydrin-based epoxy resin and cycloaliphatic polyamine-based hardener. Six different boron compounds including colemanite (C), ulexite (U), boric acid (BA), boric oxide (BO), melamine borate (MB) and guanidinium nonaborate (GB) were used as flame retardant additive. The flame retardant properties of epoxy-based composites were investigated using limiting oxygen index (LOI), UL 94 standards both in vertical and horizontal position, thermogravimetric analysis, cone calorimeter and scanning electron microscopy. 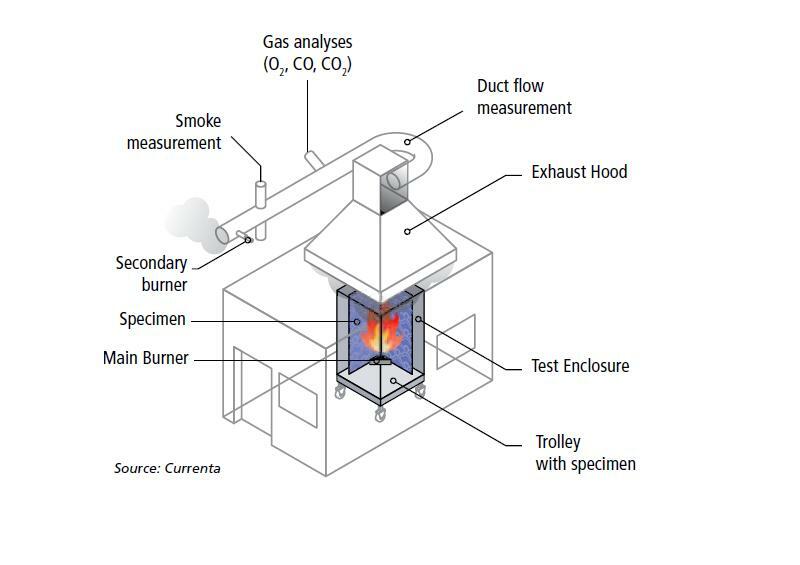 According to flammability test results, boron compounds except for C and U showed better performance than ATH. According to the LOI results, 40% BA containing sample had the highest LOI value of 28.5, while 30% MB, 35% GB and 40% BA containing samples had the highest UL 94V rating (V0). According to the cone calorimeter test results, all boron containing samples had better fire performances than ATH containing sample; 40 wt% BO containing sample showed the lowest peak heat release rate, average heat release rate and total heat release values.